Vikram our raft expert was giving instructions on a serious note. The light banter of the day before was completing missing. I had no idea what had caused the change! But it did not take me long to find out! 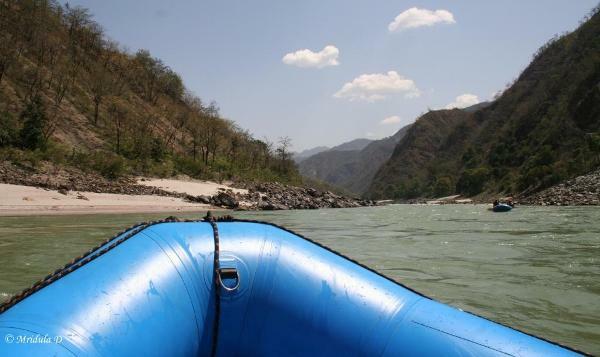 We were rafting from Kaudiyala to Rishikesh (in Uttarakhand, India) on the Ganges. I was part of a large group, we were in seven rafts. There were six of us in my raft apart from Vikram, our expert. And all of us were good at following instructions. Vikram had told us about a rapid called “The Wall” but as I didn’t know what a grade 3 + rapid meant, I was least bothered. We started off gently down the river, as usual indulging in water fights and other pranks. After a while Vikram became serious and asked us to pay attention. We were about to cross ‘The Wall.’ When we hit the rapid we got drenched within seconds. But we kept rowing with all our might. It felt that the water was reluctant to let us part. But after some struggle we were on the other side of ‘The Wall’ (click on the link to see a Youtube video of a raft overturning at The Wall). We were the second raft to attempt the crossing. When we were safe on the other side we saw that the first raft had overturned and every one was thrown out in the water. We had been given instructions about things to do in such a situation. The first was not to panic as everyone was wearing a life jacket. The other important instruction was to swim/float to the shallow side of the river, towards the bank. We now turned back only to see that the third raft had also flipped at ‘The Wall’ and there were paddles and paddles floating in the water. There were people too. By now our eyes were glued to the rapid. The fourth raft did not overturn but everyone got thrown out none the less. More paddle and people in the water by now. The fifth raft overturned and once again there were even more people and paddles in the water. By now our kayak team was working overtime. We though that the final raft would pull through. It started cresting on the wave but ‘The Wall’ had other ideas. This raft also met the same fate as others. By now all the seven rafts were accounted for and only our raft had people in it. We looked in amazement at the scene. Gradually people started regrouping and four rafts proceeded once again. After a short distance our experts decided to bank and wait for the other three to join us. It was getting quite late and there was no sign of other rafts. There was no cell phone signal in the area. After an hour and half the entire group was reunited. Some among us decided they had enough of rafting by now. We got to know that two people got stuck on the right side of the river along the cliffs and it took about 50 minutes to rescue them. The stretch after this offered no fresh surprises. Even though some time has lapsed since I went on this trip, I have to say it was completely an Alive is Awesome experience. PS. I got the first gift hamper from Cinthol. 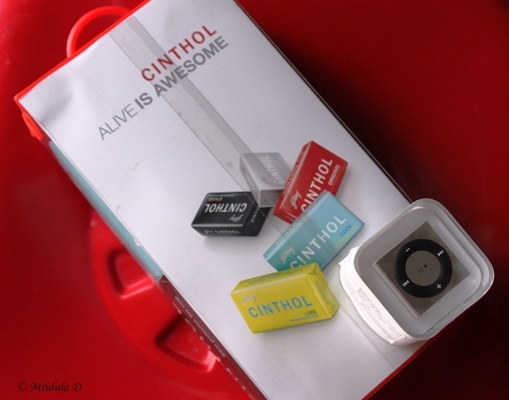 This post is a part of the Alive is Awesome Bathing Experience by Cinthol. My younger nephew is now using the iPod which was there in the hamper. And my daughter ran around with all the Cinthol Soaps and the Deo. She is of the age when anything new has to be tried instantly. Before I could do anything she tore open two soaps and deposited it in her bathroom. These days when she takes a bath she insists that it has to be with the green soap! I have managed to hide the other soaps, out of her reach, when she got distracted for a while.